Your body needs cholesterol to work well. But cholesterol levels that are too high can harm you. A blood cholesterol test measures the level of total cholesterol. This includes HDL (good) cholesterol and LDL (bad) cholesterol. Your LDL level is what health care providers watch most closely. You want it to be low. If it gets too high, you will need to treat it. You may also need medicine to lower your cholesterol. You want your HDL cholesterol to be high. Exercise can help raise it. You do not have heart disease or diabetes. Your cholesterol levels are in the normal range. These healthy habits may help prevent future heart attacks and other health problems. Eat foods that are low in fat. These include whole grains, fruits, and vegetables. Using low-fat toppings, sauces, and dressings will help. Look at food labels. 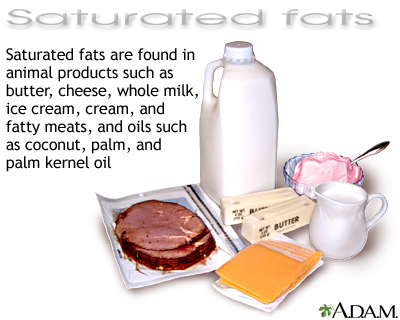 Avoid foods that are high in saturated fat. Eating too much of this type of fat can lead to heart disease. Choose lean protein foods, such as soy, fish, skinless chicken, very lean meat, and fat-free or 1% dairy products. Look for the words "hydrogenated", "partially hydrogenated", and "trans fats" on food labels. DO NOT eat foods with these words in the ingredients lists. Limit how much fried food you eat. Limit how many prepared baked goods (donuts, cookies, and crackers) you eat. They may contain a lot of fats that are not healthy. Eat fewer egg yolks, hard cheeses, whole milk, cream, ice cream, and cholesterol and lifestyle. Eat less fatty meat and smaller portions of meat, in general. Use healthy ways to cook fish, chicken, and lean meats, such as broiling, grilling, poaching, and baking. Eat foods that are high in fiber. Good fibers to eat are oats, bran, split peas and lentils, beans (kidney, black, and navy beans), some cereals, and brown rice. Learn how to shop for, and cook, foods that are healthy for your heart. Learn how to read food labels to choose healthy foods. Stay away from fast foods, where healthy choices can be hard to find. Get plenty of exercise. And talk with your provider about what kinds of exercises are best for you. American Diabetes Association. 9. Cardiovascular disease and risk management: standards of medical care in diabetes-2018. Diabetes Care. 2018; 41 (Suppl 1):S86-S104. PMID: 29222380 www.ncbi.nlm.nih.gov/pubmed/29222380. Eckel RH, Jakicic JM, Ard JD, et al. 2013 AHA/ACC Guideline on lifestyle management to reduce cardiovascular risk: a report of the American College of Cardiology/American Heart Association Task Force on practice guidelines. J Am Coll Cardiol. 2014;63(25 Pt B):2960-2984. PMID: 24239922 www.ncbi.nlm.nih.gov/pubmed/24239922. Heimburger DC. Nutrition's interface with health and disease. In: Goldman L, Schafer AI, eds. Goldman-Cecil Medicine. 25th ed. Philadelphia, PA: Elsevier Saunders; 2016:chap 213. Mozaffarian D. Nutrition and cardiovascular and metabolic diseases. In: Zipes DP, Libby P, Bonow RO, Mann DL, Tomaselli GF, Braunwald E, eds. Braunwald's Heart Disease: A Textbook of Cardiovascular Medicine. 11th ed. Philadelphia, PA: Elsevier; 2019:chap 49. Pencina MJ, Navar-Boggan AM, D'Agostino RB Sr, et al. Application of new cholesterol guidelines to a population-based sample. N Engl J Med. 2014;370(15):1422-1431. PMID: 24645848 www.ncbi.nlm.nih.gov/pubmed/24645848. Stone NJ, Robinson J, Lichtenstein AH, et al. 2013 ACC/AHA guideline on the treatment of blood cholesterol to reduce atherosclerotic cardiovascular risk in adults: a report of the American College of Cardiology/American Heart Association Task Force on practice guidelines. Circulation. 2014;129(25 Suppl 2):S1-S45. PMID: 24222016 www.ncbi.nlm.nih.gov/pubmed/24222016.